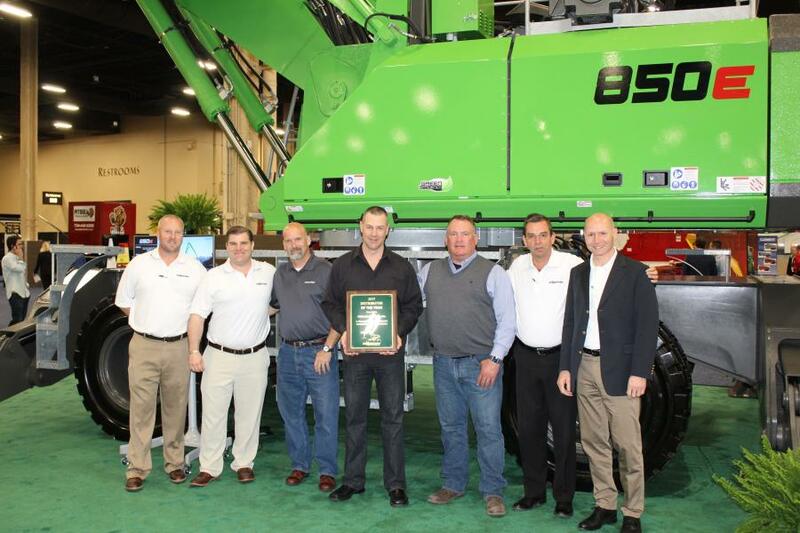 (L-R) are Tim Hyland and Bill O’Keefe of Sennebogen; Eric Marburger, sales manager; Barry Talley, territory manager; Pat Sherwood, executive vice president of Midlantic Machinery; Constantino Lannes and Erich Sennebogen of Sennebogen. Each branch is staffed by a sales specialist who had been trained in material handling applications at the Sennebogen Training Center near Charlotte, N.C.
“We had our staff take the training before and have decided this year that we're going to send them to Sennebogen again for a refresher. All our mechanics go down there regularly, as well. The factory training and facility are first class,” he said. To complete the plan, each branch is well-stocked with Sennebogen service parts, ensuring immediate delivery for customers' most common needs. According to Sherwood, sales branches are equipped with flexible financing and lease packages from Sennebogen Capital, to help seal the deal. Sherwood noted that sales and service for Sennebogen customers is a team effort. Along with working together to develop the business plan, Sennebogen specialists join Midlantic's sales staff to meet with the customer, review the application and make a recommendation for what the customer needs. For more information, call 704/347-4910 or visit Sennebogen-na.com.